Debt has no place in traditional academic macroeconomic models. Successful traders and speculators, however, have always relied on debt cycles to predict crashes. After the Great Recession and following Minsky heritage, academics started to pay more attention to debt cycles. They use High Yield corporate credit as reference. In this article, we take look at the HY credit market and try to offer a preview of the future. Several known traders, like George Soros, Stanley Druckenmiller or Ray Dalio, have proposed that the economic cycles are heavily correlated with credit market cycles. This means that when we have strong economic times, the excesses tend accumulate on the financial system, which, due to its endogenous frailty, tends to go from boom to bust. In the end of a bull market, it is the credit contraction that pushes the recession forward. The academic world also had a proponent of such theory, Hyman Minsky. However, his theories have failed to attract much attention in the mainstream economics, or for that matter, policymakers in Central Banks. Nevertheless, the academic world is now watching a renaissance of the credit cycle theory. Researchers claim to have developed a model based on the credit cycle that is capable of predicting recessions. Academics claiming oracle-like status is nothing new in economics, but this time they seem to be onto something. The truth is that several known traders, as the ones mentioned, have made entire careers navigating through the storms of boom-and-bust cycles in credit markets. Therefore, if people have made a living out of this type of pattern recognition, it is only logical that academics try to test it scientifically. Theory behind the boom-and-bust cycle has been around for some time in many forms, but it has been overlooked by the academic world for a long time. Samuel Hanson and Robin Greenwood are among the academics that tried to tie the knot between credit fluctuations and economic cycles. In their work Issuer Quality and Corporate Bond Returns, they provide evidence that debt issuance and financing costs supported by low quality companies (HYG) (JNK) are useful in forecasting credit market overheating. This tends to be more useful than just looking at the global credit growth (AGG). This makes sense because during euphorias, risks tend to be overlooked, which results in low quality firms receiving credit at a lower price than should be realistic during normal times. Where are we in the economic cycle? Danielle DiMartino Booth, in a Bloomberg piece, argued that the share of non-investment grade credit is bigger than the figures present, because there is a huge amount of BBB corporate credit (the last before “junk” status) being counted as investment grade. This means that even a small deterioration in fundamentals might kick the BBB tranche to junk and reveal a very different reality in the corporate credit market. Basically, what she is saying is that the share of high yield credit is probably much higher than the current figures suggest. 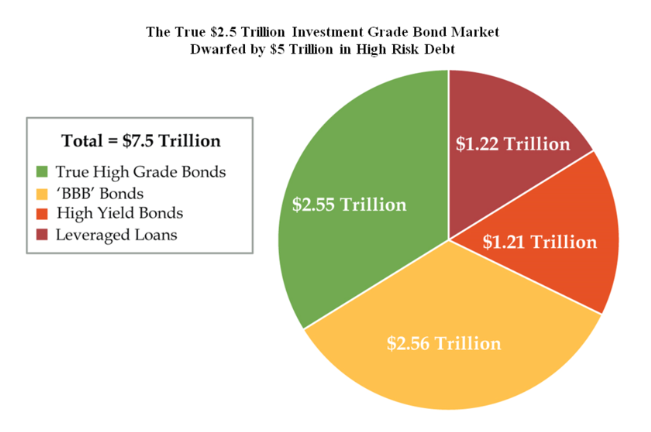 In graph 2, we can see that the medium grade bonds have skyrocketed, taking the place of high grade debt. Meaning that, if rating companies repeat the subprime mistake of selling investment grade ratings to speculative companies, we might have an explosion in non-investment grade debt. In graph 3, we can see that we are in all-time highs in terms of Corporate debt to GDP, and since the mix inside the investment grade pool has shifted from high grade to medium grade, we must question ourselves about the quality of this debt. To reinforce the narrative of a lax high yield corporate credit market, we might add that the default rate in this category is at a very low level, which might be reinforcing the idea that high yield companies are in very good shape and loans can keep rising. This is confirmed by high yield spreads, which are close to historical lows, meaning that investors have appetite for HY debt even when the market seems overheated. 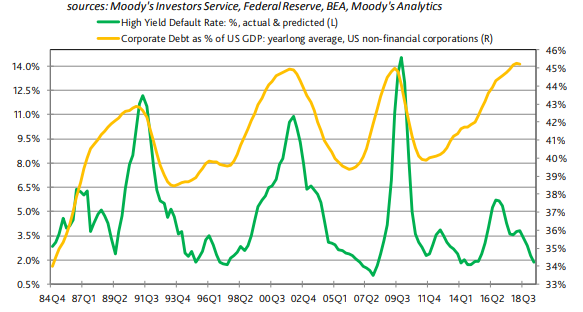 What might turn the tables in the corporate credit market? In most economic developments, we can identify one trigger that changes the whole thing. Obviously, it’s not like that trigger was the sole responsible for the chain of events, after all imbalances accumulate over time. However, a moment arrives when we cannot just carry on our business-as-usual routine. For instance, we can argue that the subprime crisis officially started when huge amounts of mortgages bearing teaser rates, kicked-in full interest rates. Many loans needed refinancing, and all came down when banks refused to loan money between them and overnight spreads on interbank loans skyrocketed. 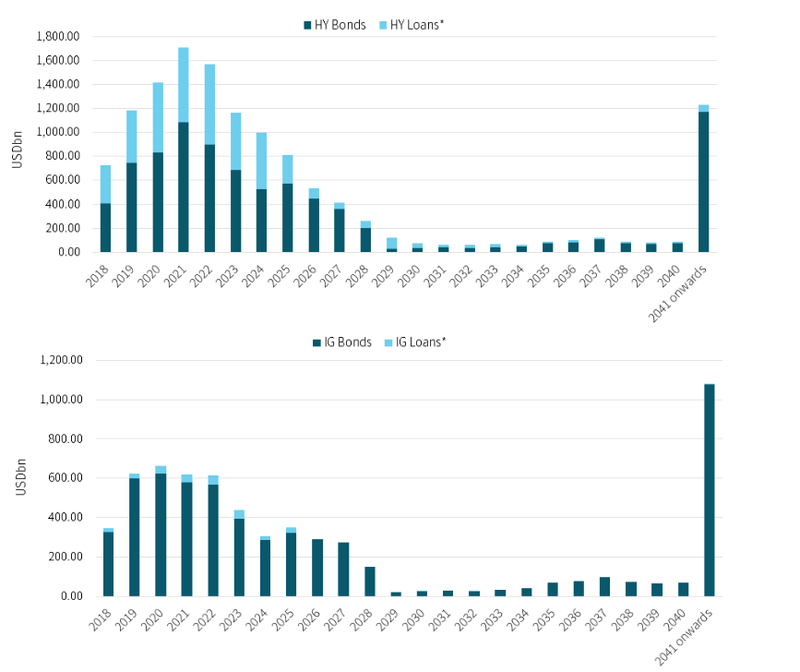 Looking at the graph 5, we can see that the needs for refinancing high yield credit will peak in 2021, but by 2020 the refinancing needs will already have doubled the 2018 figures. Actually, by 2020, the whole corporate credit market will have refinancing needs that double the ones in the present year. By then, with the positive effects of the tax reform already wearing off, a hiccup like a high-profile insolvency might make everyone scared and initiate a credit contraction. This analysis tells us that the next 2 or 3 years carry considerable risk for a credit contraction. If we add the present turmoil in emerging markets, we are almost carried to 1997. Back then, the Asian crisis brought with it the first signs of financial instability, that was followed by a capital return to the US that strengthened the dollar and helped fuel the dotcom bubble. Does it feel familiar?